I have a new family member to introduce you to! 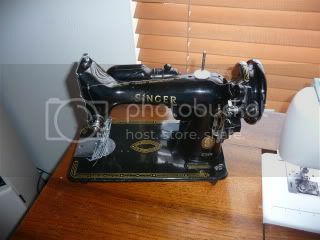 It's my new Singer, which is older than I am. I got it from eBay Singerman12, who fully refurbishes and tests the machines he sells. It's adorable and tiny and extremely heavy. That's because it is made of all metal, in a they-sure-don't-make-'em-like-the-used-to kind of way. 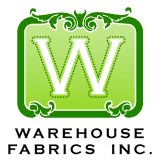 It's an industrial strength machine, which means it can handle thick, heavy fabric in a way my Kenmore can't. It's basic. It can only do a straight stitch. 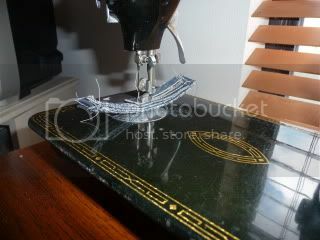 It came with lots of presser feet to do gathering, piping, zippers, etc., but no zig-zag, overcast or blind hem. But that's fine, because I can use my Kenmore for that. I was having some trouble doing free-motion quilting because the fabric was catching on the face plate. Then I noticed the metal was all chewed up, I guess from the needle striking it. The sewing machine repair shop said it was from sewing too-heavy fabric and forcing it through, thus bending the needle slightly out of whack. 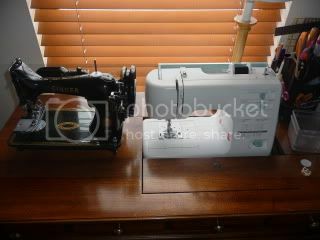 Now I can get my Kenmore fixed up and use my Singer for heavy-duty work!